Visit Ireland’s famous natural wonder at the Wild Atlantic Way. 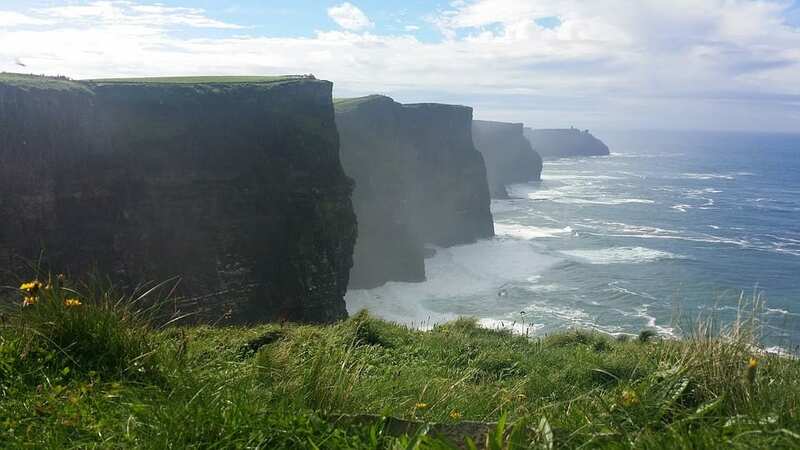 Look at the sea as you stand metres high on rough cliffs that have been in the making for 300 million years and given the title of the seventh most beautiful and extraordinary UNESCO heritages in the world. Spend plenty of time walking along the beautiful coast and embrace the nature’s beauty. Discover many birds, land and sea-life mammals. Keep an eye on the great sea stack, Branaunmore, as it was once part of the cliffs but has been split due to erosion. It reaches 67 metres up in the air – breathtaking. Did you know that one of the cliff’s sea caves has featured in “Harry Potter and the half-blood prince”? A village located in County Kerry and part of the stunning Ring of Kerry trail. It’s a historical outdoor paradise. Take a boat tour on Lough Leane, the local lake, with Waterbus and gasp at the historical ruins and waterfalls. The tour departs at Ross Castle and the boat brings you past the Innisfallen Island in the middle of the lake. Visit the Muckross Abbey, and explore the Torc Waterfall, only a small drive away. If you’re really adventurous, you should head off to the Skellig Islands in the South-West of Kerry. Book here. Your kids will love this and you will too! 6000 years of living in the Ballyhoura region… An archaeological site in the county of Limerick where humankind has lived here since 3000 BC. Remains of the Stone Age have been uncovered. Bourchier’s Castle, ruins of an early Christian church and the Norman Black castle can be discovered here. Park your car at the car park available on-site and ask for information at the Visitor Centre. Enjoy hill-side walks and beautiful views of this protected historical lake. 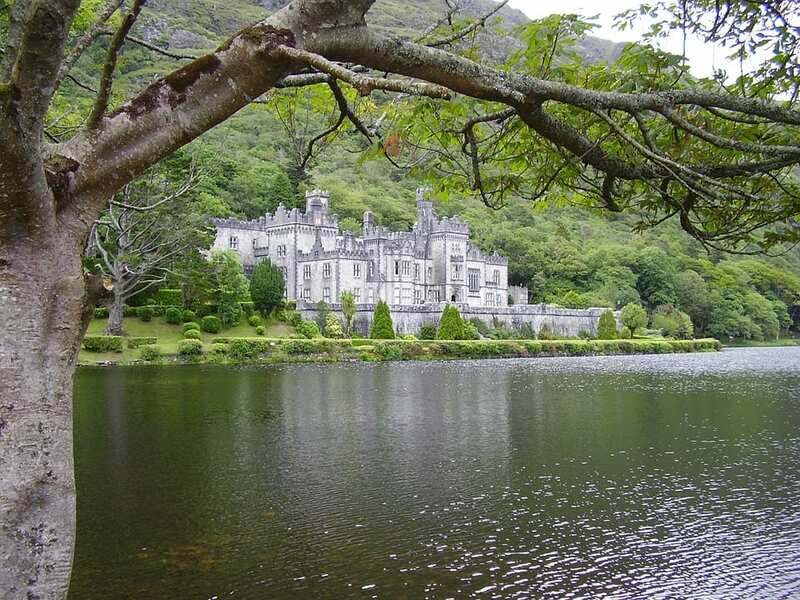 In the mountains of Connemara, in County Galway, lies Kylemore Abbey, built in the early 19th century. It’s a former boarding school run by a Benedictine community in the middle of nowhere. It has only closed its doors in 2010 and is great to explore as it has a small shuttle driving up to its very own Victorian Walled Gardens, the largest of Ireland, where the girls used to work in. Find out about its former history during the times of Henry Mitchell and his wife and afterwards the Duke & Duchess of Manchester, to whom Mitchell sold the house in 1903. Dingle is a fabulous creative place known for its fishing port. Visit its charming streets, colourful houses and enjoy pints of Guinness in its inviting live-music pubs. Go explore the Irish famine cottages and how modest farmers and their families used to live in the 19th century. If you’re by car you should drive up to SLA Head to enjoy the fabulous view of the islands and the sea. Go dolphin watching with your kids or drive out to the Blasket islands and meet Fungie, the Dingle dolphin. Book your tour here and don’t miss out on this unique chance. Located in Northern Ireland, it’s quite a trip to get up there but it’s worth it. Explore the rough coast just a few sea miles away from Scotland’s coast. 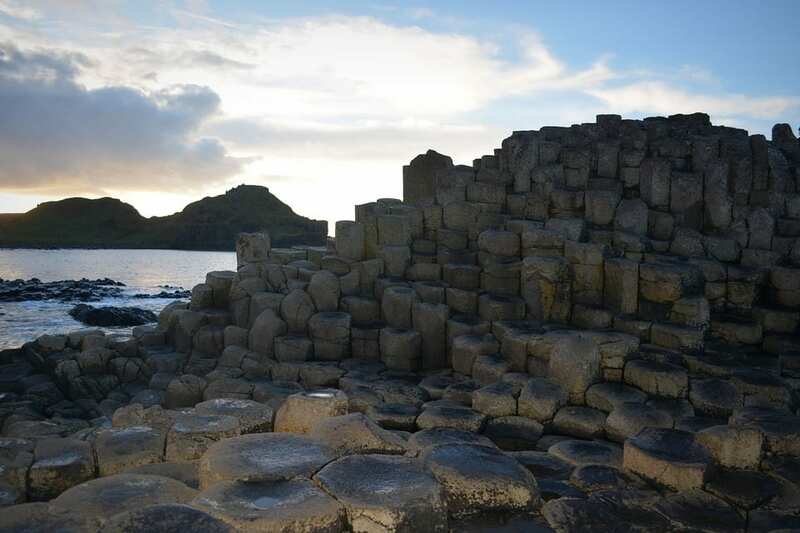 The Causeway is known for its thousands of hexagonal basalt column stones, the result of volcanic eruption. It’s a natural reserve and visited by many tourists each year. Hike up to the surrounding cliffs and get a chance for a great from-the-top view onto the causeway. A Gaelic legend tells that the area was created by a giant. Bushmills are situated only a few miles away and is home to the oldest Whiskey in the world. Situated right in the middle of Ireland, Lough Boora is a great discovery park. As it’s home to countless species of birds and wildlife, it’s perfect for bird watching. Huge sculptures, created by old industrial materials such as old locomotives, make the park special and fun for kids. If you love cycling, walking and are a bit sporty, this is the perfect Sunday trip with your family. For all angling buffs, the lake is suitable for any age – work your best! In County Clare, on the west coast, you’ll find Bunratty Castle, a medieval and Victorian building erected in the 15th century. It’s a great place if you’re into history as it’s been built by the Vikings. As most castles in Ireland, it features a stunning walled garden which can be visited. Stay in one of the great accommodations in the surroundings. Finally, Dublin our love. Not as peaceful as all of the mentioned above but certainly much to explore, a blend of medieval and high-tech. It’s home to Phoenix Park, the largest city park in Europe. If you love cycling, we definitely recommend you get a bike to explore all the different sights – don’t forget to bring a hamper for a picnic. 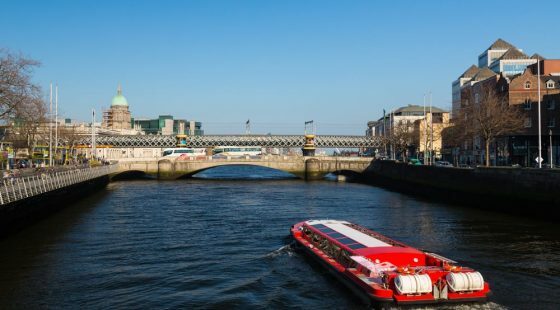 Explore the Wellington monument, the President’s house, Pope John Paul’s cross and if you have time, drop by Dublin zoo as kids absolutely love petting and feeding animals. Meet Leo the lion from MGM films and leave the park through its famous gates.